As mentioned yesterday, I’m a bit buried at the moment in work. Accordingly, a single image greets you today, depicting my favorite Halal Meats food cart here in almond eyed Astoria. These cats, and their thriving enterprise, are found at 34th avenue and Steinway Street. 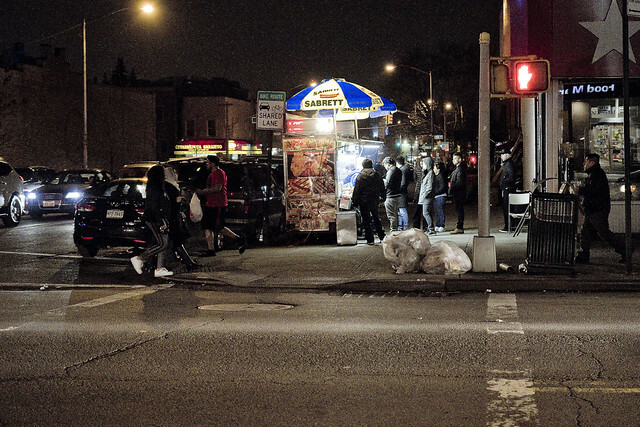 As you can see, even well into the evening – there’s always a lineup of people waiting for chow. If you’re in the neighborhood – I recommend their two kabab hero sandwich, which is stuffed with eggplant, onions, and drowned in both yogurt and hot sauce.